The aquatic macrophyte Stratiotes aloides L. is of conservation concern in central Europe due to its high importance for biodiversity in lowland floodplain and ditch ecosystems. However, over the last decades this species has shown population declines for instance in Germany or the Netherlands. S. aloides is dioecious with male and female individuals, in mixed or separated stands, often reproducing vegetatively. Generative reproduction is observed less frequently, but of great importance for declining plant populations facing threats of habitat destruction and eutrophication. 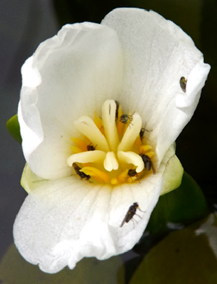 Precisely which arthropods transfer S. aloides pollen was previously unknown. We examined flower visitors of S. aloides in the 2011 and 2014 flowering seasons in ditches of a wet grassland ecosystem in Bremen, Northwest Germany. Hydrellia tarsata Haliday (Diptera: Ephydridae) was found abundantly in male and female flowers of S. aloides in both years. Pollen of S. aloides was actively transferred by H. tarsata and reproduction of the fly in S. aloides leaves was detected by rearing H. tarsata from extracted puparia. The mining Hydrellia were parasitised by the braconid wasps Chaenusa “punctulata” Burghele and Chorebus “densepunctatus” Burghele, which also visited S. aloides flowers in 2011 and 2014. These results point to a mutualism between S. aloides and the ephydrid H. tarsata, with both partners benefiting with their own reproduction. This relationship between plant and dipteran pollinator is however complicated in a tritrophic interaction with the braconid parasitoids, which infest the mining stages of the ephydrid flies and could potentially also transfer S. aloides pollen.